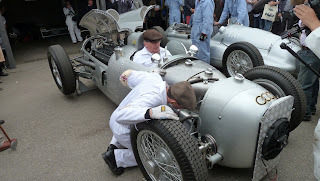 Happily I was standing in front of one of the Karrasik model Auto Union Type Cs when it was started up. All of the cars were warmed up for a few minutes before going on the track in order to get everything up to temperature before the demonstration run. These are the specs for the Type C - and don't forget, this car was made in 1934!